As you read this article, take a moment and consider the amount of radiation that is pulsing through your body. Wait…What? It is not something that you often contemplate, is it? Did you count your smartphone with Bluetooth connecting to your car or your new wireless smart speaker system? How about your router connecting to your computer, or possibly hundreds of computers if you work in a large office space? Did you consider the Smart-Meter on your home or office building? Did you count some of newest “wearable technology” for fitness tracking? Did you know that your cell phone, tablet, and other wireless devices come with a warning? In today’s world, we are constantly bombarded with something called electric and magnetic fields (EMFs). First, there are two types of radiation. One is called ionizing and is known to be associated with structural changes to DNA. Thus, we take precautions around things like X-rays and radon. Conversely, non-ionizing radiation comes from microwaves, cellphones, wearable technology, and radio frequencies, and even the most up-to-date literature suggests that these frequencies are not harmful, if used properly. The trend in this field is to have lower power emitters that are higher frequency devices that we keep closer to our bodies. Let that sink in. 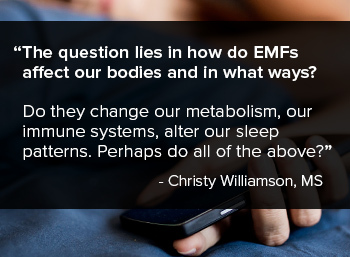 The question really lies in how do EMFs affect our bodies and in what ways? Do they change our metabolism, our immune systems, alter our sleep patterns, or perhaps do all of the above? First, let’s discuss what you may have heard about the dangers of “blue light.” Blue light comes from electronic devices and alters your perception of daylight. Light helps to regulate our sleep/wake cycles via the pineal gland and its secretion of a hormone called N-acetyl-5-methoxytryptamine or melatonin. Interestingly, melatonin also scavenges free radicals and supports endogenous detoxification enzymes like superoxide dismutase (SOD), glutathione peroxidase (GPX1), and glutathione reductase (GSR). Do you remember all of those electronic devices you counted a few minutes ago? Overall, the message is that there is a possibility that EMF radiation may decrease melatonin production and may increase reactive oxidation. Further, the distance to which the signal is from your body may determine the effect of which it will have on you and your sleep patterns. Now, let’s imagine that you have one of those really cool devices that you wear twenty-four hours a day. This wearable technology has the ability to monitor your sleep, heart rate, act as a pedometer, and boost your confidence by telling you what an incredible athlete you are! Keep in mind that when you go to bed at night you probably don’t turn off your cordless phones, internet router, air conditioner, electric smart meter, or circuit breaker. In addition to the constant barrage of radiation coming from your house, you now have an emitting device under your pillow. So what can we do? Despite having arguably better music, I don’t think we need to go back to the 1980’s. Multiple studies show that a diet rich in nutrients and phytonutrients help to fight reactive oxygen species (ROS). This is a diet that is full of organic fruits, vegetables, low mercury seafood, pasture meats, and good quality fats like monounsaturated and polyunsaturated fats that you would find in nuts, seeds, avocados, and coconut oil. To reduce the stress on detoxification enzymes like N-Acetyl Transferase (NAT1 and NAT2), consider the avoidance of smoke, pesticides, insect sprays, charred meats, red meat, metal toxicity, chemicals, and solvents while considering the addition of acetylators like berries and grapes balanced with adequate fiber. Glutathione support may play a role as does vitamin C as it may affect the enzyme Glutathoine-S-Transefrase-1 or GSTT1. If you have these wearable devices, remember that distance matters. Most of these devices do not have a “sync mode.” This means that it is always trying to connect and is always emitting radiation. The companies have not published a Specific Absorption Rate or SAR to compare these devices’ radiation with cellular phones. However, this is classified as a Very Low Frequency device which means that it has the capacity to transmit frequencies up to 30khz and at wavelengths up to 10 kilometers. Consider wearing the device away from vital organs and let the device sleep when you sleep. Another consideration is to use the device for a week at a time to track your habits; then stop using the device. You will have your information logged and available for your use, but sans the daily radiation. And a few final thoughts include unplugging, getting back to nature, and listening to Bon Jovi on vinyl. Christy Williamson has a master's degree in human nutrition from the University of Bridgeport and is a candidate for both the Certified Nutritional Specialist and Doctor of Clinical Nutrition. Christy is currently collaborating to create a database of genomic material to facilitate state of the art research on rare diseases. Christy was active in the 2016 Virginia General Assembly in the passage of legislation which established a statutory definition of nutritional genomics. With a colleague, Christy developed a course in nutritional genomics for Maryland University of Integrative Health. Christy is the owner of Nutrigenomic Health Consulting, LLC. Her company focuses on functional nutrition as it relates to biochemical nuances within the genome and microbiome. Christy and her company are based in Midlothian, Virginia. Simkó, M, Mattsson M. Extremely low frequency electromagnetic fields as effectors of cellular responses in vitro: possible immune cell activation. J Cell Biochem. 200493(1):83-92. Sies, H, Stahl, W. [beta]-carotene and other carotenoids in protection from sunlight. American Journal of Clinical Nutrition, 2012. 96(5):1179. Katoch, O, Kumar, A, Adhikari, J, Dwarakanath, B, Agrawala, P. Sulforaphane mitigates genotoxicity induced by radiation and anticancer drugs in human lymphocytes. Mutation Research - Genetic Toxicology and Environmental Mutagenesis. 2013. 758(1-2), 29. Verhoeven, D, Goldbohm, R, van Poppel, G, Verhagen, H., van den Brandt, P. Epidemiological studies on brassica vegetables and cancer risk. Cancer Epidemiol Biomarkers Prev. 1996. 5(9):733-748. Cornblatt, G, Ownby, S, Cornblatt, B. The synergistic effect of a sulforaphane and maitake mushroom extract combination on the expression of the detoxifying enzymes NQO1 and UGT1A1. AACR; Can Prev Res. 2013. 6(11 Suppl): Abstract nr B22. Emerit, I, Oganesian, N, Sarkisian, T, et al. Clastogenic Factors in the Plasma of Chernobyl Accident Recovery Workers: Anticlastogenic Effect of Ginkgo biloba Extract. Radiation Research, 1995. 144(2), 198–205. Jung, JH, Jung, J, Kim, SK, et al. Alpha Lipoic Acid Attenuates Radiation-Induced Thyroid Injury in Rats. PLoS ONE, 2014. 9(11):e112253.